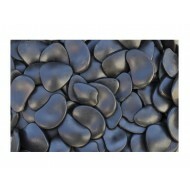 These decorative plastic landscaping rocks are a lightweight alternative to real stones. Save time, money, and your back by using plastic recycled rocks. 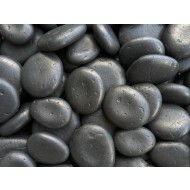 Rockafillers allow you to cover more square footage per pound than regular stones. Use them in plant containers are top dressings, in water features, or as ground cover in larger landscaping projects. Rockafiller faux rocks rovers 2.5 times more surface area than real river rock when compared by weight. Thier lightweight composition makes checking soil moisture hassle free and decreases weight stress on your plant containers. Plastic rocks are perfect for water features. They won't add unsightly dirty and debris to your creative water designs. Our poly-molded pebbles will save you on clean up time as compared to other top dressings such as Spanish Moss or American Fiberex Moss. Rockafillers are manufactured in the United States using recycled poly product.